'Breakthrough' diabetes treatment Jump to media player A trial run of a type 2 diabetes treatment by a West Midlands hospital trust has been hailed as a major breakthrough. 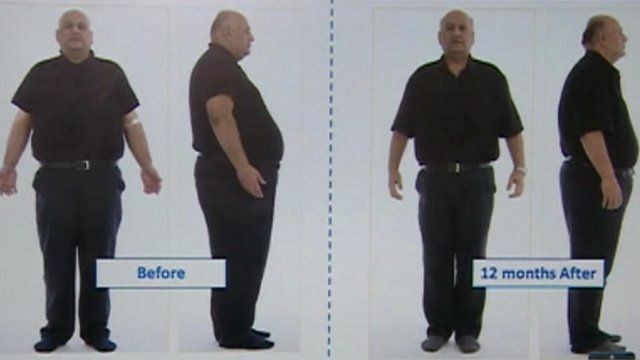 Weight loss surgery rising in West Midlands Jump to media player The number of people having surgery to help them lose weight is on the increase in the West Midlands. A trial run of a type 2 diabetes treatment by a West Midlands hospital trust has been hailed as a major breakthrough. The two-year programme involved putting a latex tube, known as an Endobarrier device, into the patient's small intestine to reduce the rate at which food is absorbed. About 100 people took part in the project at City and Sandwell hospitals, losing on average two stone in weight and drastically reducing their blood sugar levels. Nick Pharhani, 52, who lost four-and-a-half stone (28kg), said: "I do feel a lot more positive about myself."